The Vietnam War was the first conflict in which helicopters played a major role, initially for rapid troop deployment in a country in which other forms of transport were slow and subject to guerrilla attack. The necessarily low-flying helicopters were vulnerable to ground fire, particularly when landing or picking up troops, so some were fitted with machine guns. These were initially mounted in the windows or doorways of transport helicopters on simple pintle mounts, a practice which continues to this day with weapons of up to 20mm calibre. It was not long before the advantages of a purpose-designed ground-attack helicopter became apparent. A smaller, two-man fuselage made it possible to fit armour protection and allowed for a more powerful gun, usually mounted in an under-nose turret. Rockets, bombs and anti-tank missiles could be carried under stub wings. The first of these was the Bell AH-1, which arrived in time to see service in Vietnam. Kamov Ka-50 have emerged, although these are still larger and heavier than their Western equivalents. The gun armament of these helicopters has developed in different ways from that of fighter aircraft. It is almost entirely optimised for ground-strafing and therefore usually flexibly mounted so it can be rapidly traversed onto new targets. In modern applications, the mountings are computer-controlled and may be aimed by helmet-mounted sights; the gun will point wherever the gunner looks. However, most attack helicopters can be fitted with additional fixed gun pods, and there is a tendency in some cases to fit more powerful cannon for the anti-helicopter role. There is much more variety of gun armament in helicopters than there is in fighter aircraft. Targets vary from unprotected troops to armoured vehicles and other helicopters, so weapon fits available include rifle-calibre and heavy machine guns, cannon of 20-30mm and 40mm grenade launchers. perhaps something in between? If they choose a powerful weapon, how do they cope with the recoil effects, which when firing to one side might well deflect the helicopter enough to move the gun off aim? The smallest weapon normally fitted to the turrets of attack helicopters is the HMG. The rate of fire of the usual army weapons was judged insufficient for this role, so new rotary guns have been developed in both the Soviet Union and the USA. The four-barrel Soviet YakB-12.7 (Yakushev-Borzov) - the complete mounting being known as the 9A624 or USPU-24 - uses the usual 12.7 x 108 round and was introduced in the 1970s for mounting in an under-nose turret in the Mi-24 Hind-D attack helicopter. However, experience in Afghanistan indicated the need for longer range; the Mi-24VP (Hind-E) turret was accordingly fitted with the 23mm twin-barrel GSh-23 cannon in the NPPU-24 mounting and the Mi-24P (Hind-F) was given the powerful, fuselage-mounted, twin-barrel 30mm GSh-30K, with longer barrels than the GSh-30, in the NPPU-30 mount. 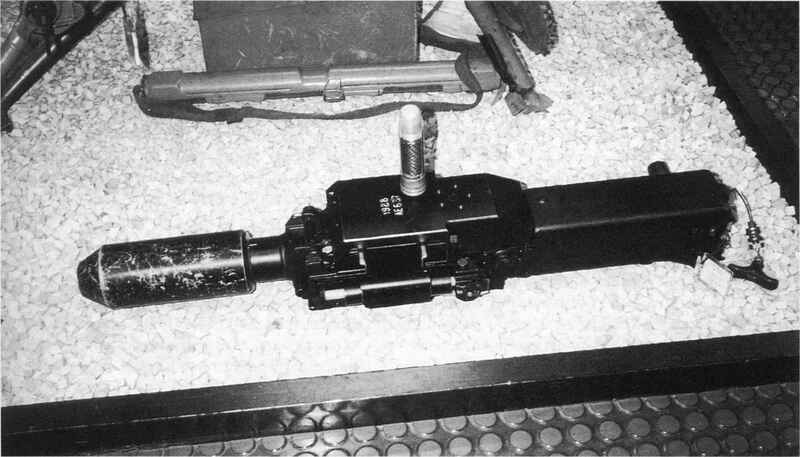 The General Electric company developed two versions of their GECAL 50 with a choice of three or six barrels, the smaller of which has now been adopted as the GAU-19A. Ammunition is the standard 12.7X99. Interestingly, the GECALs were originally offered with either externally driven or gas operation, but the GAU-19A retains the American preference for external power. Most Western attack helicopters are fitted with cannon. These use the same ammunition as fighter guns, but do not require such a high rate of fire; in fact, that would be a disadvantage because helicopter guns tend to be used for much longer bursts of fire, so barrel cooling and ammunition supply are important factors. Recoil is also a problem made worse by a high rate of fire. As it is, modern mountings often incorporate sophisticated recoil control mechanisms. 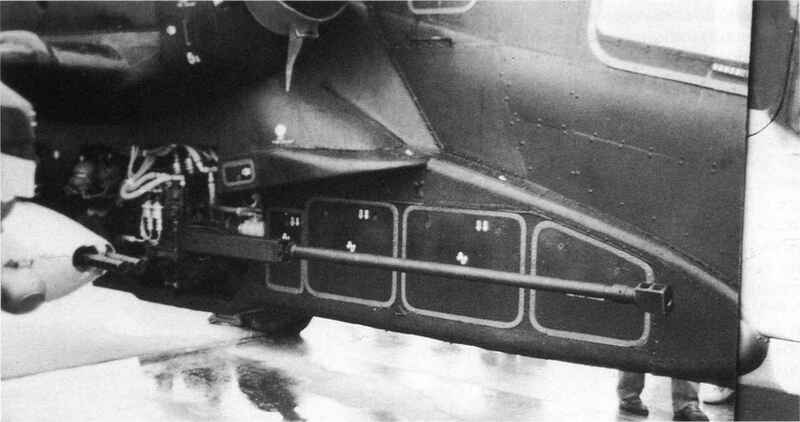 The survival of the MG 151 in French helicopters up to the 1970s was presumably due to its modest power and therefore light recoil, although in pintle-mounted form a recoil-absorbing mounting was still found to be necessary. 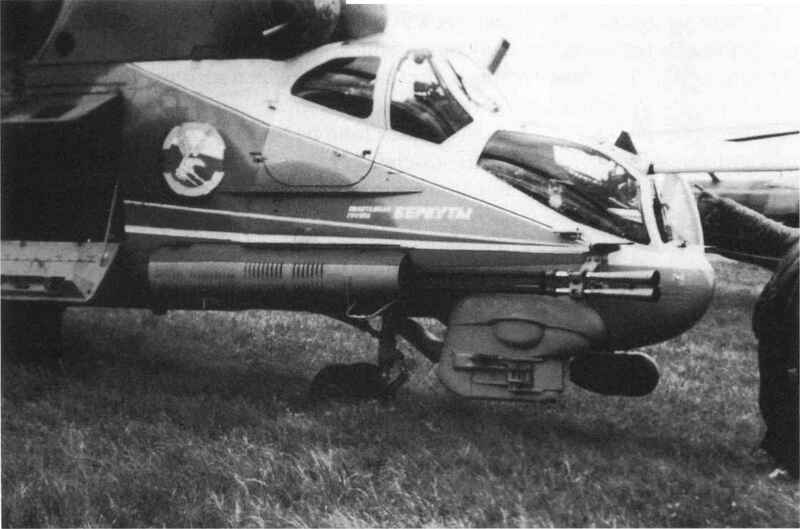 The first version of the M61 for helicopters, the belt-fed M195, featured shorter barrels (100cm) fitted with blast deflectors and was fitted to the stub wing of the AH-1G (Cobra). It was capable of 850 rpm. 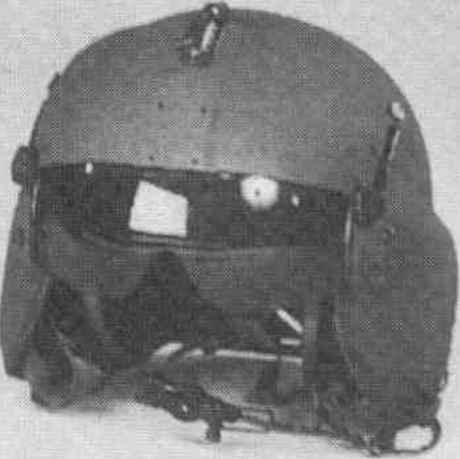 The first purpose-designed nose turret gun, the GE Ml97 fitted to the Bell AH-1J, is similar but with only three barrels of standard length and a 750 rpm rate of fire. The weapon has been retained in the current AH-1W SuperCobra and an improved for their Rooivalk attack helicopter: the 39kg XC-F2, which is a development of the Vektor GA-1, and the XC-30, which fires the 30X113B Aden/DEFA ammunition. version, the XM-301, has been developed for the RAH-66 Comanche. decades, the German version of the Tiger (now known as the UHT, for Unterstützungshubschrauber Tiger) could be equipped with a new recoilless This development led to the McDonnell Douglas Mauser weapon, the RMK 30, which is described in M230 chain gun, an externally powered weapon more detail in Chapter 6.
ful to be able to vary the firing rate in helicopter installations in order to avoid resonant vibration frequencies, which affect accuracy. The South Africans have produced two weapons accuracy. Recent Russian developments appear to favour built-in mountings. 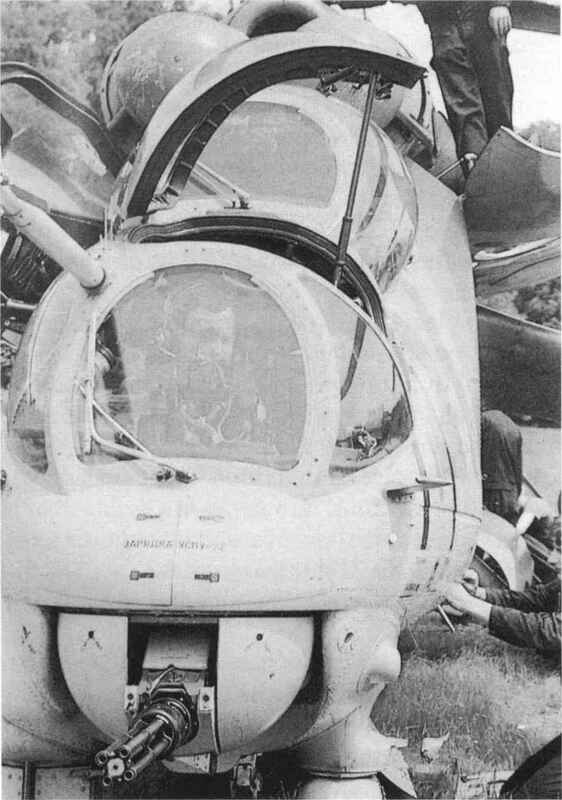 While the Mi-28 Havoc is fitted with a turret-mounted cannon (the NPPU-28 mounting being fitted with the army's 30mm 2A42), the Mi-24P Hind F has the GSh-30K twin-barrel 30mm cannon fitted to one side of the fuselage, and the Ka-50 Werewolf attack helicopter, as befits its 'fighter" status, carries its 30mm 2A42 in the same location. However, these are not rigidly fixed as they can be depressed by up to 40° and traversed 5-6°. All of these weapons use the Russian 30 x 165 cartridge, significantly more powerful than the 30 x 113B used in Western helicopter guns, although it should be noted that the army guns use percussion-primed ammunition, the GSh-30K electric. smaller helicopters. The Russians have an equivalent: an aircraft version of the 30mm AGS-17, known as the AG-17A, which weighs just 20kg, has rotary a 300-round magazine and a rate of fire increased machine gun in a lightweight chin turret suitable for to 420-500 rpm. The development of heavy automatic weapons over the past century has seen great technical advances, which have shifted in emphasis over time. The first pressures came from navies anxious to find a counter to the agile new torpedo boats which were beginning to pose a threat to large warships. They found answers initially in large-calibre, manually operated repeaters from Gatling, Nordenfelt and Hotchkiss, and later in Maxim-type automatic cannon. Similar weapons proved themselves useful to armies as light, fast-firing artillery pieces until they were eclipsed by the development of improved conventional artillery. The First World War saw the introduction of new threats - military aircraft and armoured fighting vehicles - and the development of fast-firing HMGs and cannon to counter them. 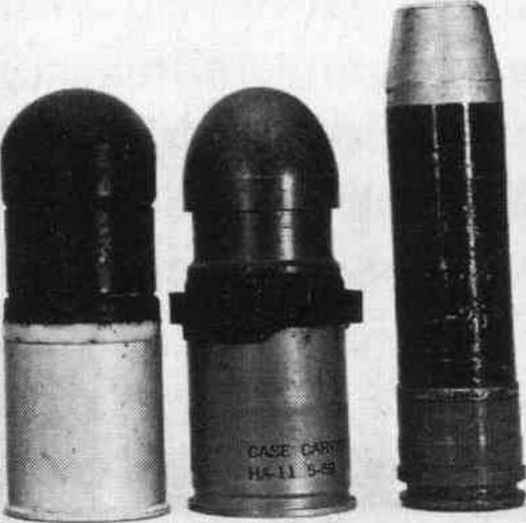 The desirability of a high muzzle velocity in these roles drove up cartridge and gun size, and several weapon types reached a virtual peak of design during the inter-war period. While the current generation of 40mm Bofors guns has much superior performance to the originals, this has been achieved by gradual development rather than the adoption of any radical new principles. The .50" Browning M2 has changed even less, and must be one of the very few military weapons still in front-line service with major armies that is over seventy-five years old. The period of twenty years starting from the mid-1930s saw the most rapid technical developments, this time driven by the need to arm aircraft with weapons capable of destroying their own kind. 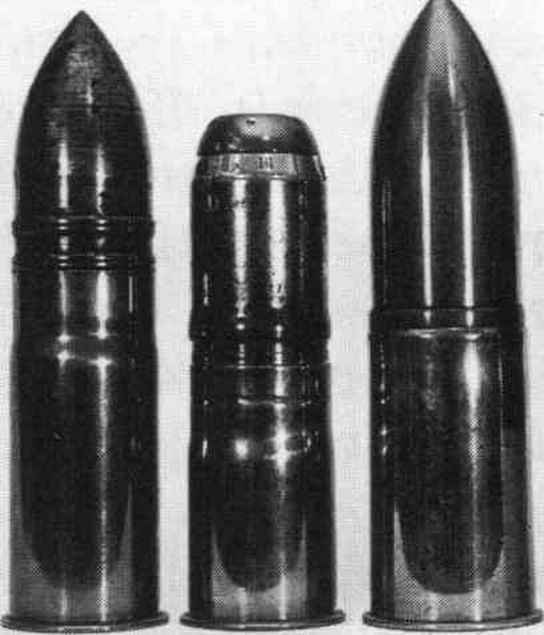 In the ammunition field, thin-walled mine shells and tungsten-cored armour-piercing projectiles made their appearance. New gun mechanisms such as the revolver and rotary cannon also emerged, dramatically increasing the destructive power of aircraft guns. This was in many ways the golden age of the heavy automatic weapon. From the mid-1950s the pace of development greatly slowed. Emphasis shifted to guided missiles, both for the anti-aircraft and aircraft armament roles, and guns were seen as a backup of secondary importance, sometimes dispensed with altogether. Despite this, guns retained a niche as light AA weapons in most (but not all) armies and navies. In the last quarter of the twentieth century, interest in heavy automatic weapons was renewed to counter two very different new threats: anti-ship missiles and armoured infantry fighting vehicles. The former threat generated a need for very fast-reacting, fast-firing, radar-controlled guns to act as a last-ditch ship defence. To meet this need, technology originally developed for aircraft guns has proved most suitable. The latter problem led to the development of much slower-firing weapons of great reliability, accuracy and penetrative power. The smaller versions of these weapons have also proved themselves well-suited to arming the new breed of attack helicopters, alongside other guns such as HMGs and grenade launchers. Finally, those same grenade launchers are finding a place as light infantry weapons, thereby returning to one of the original uses of the weapon. Throughout all this there have been few radical changes in either ammunition or operating mechanisms. 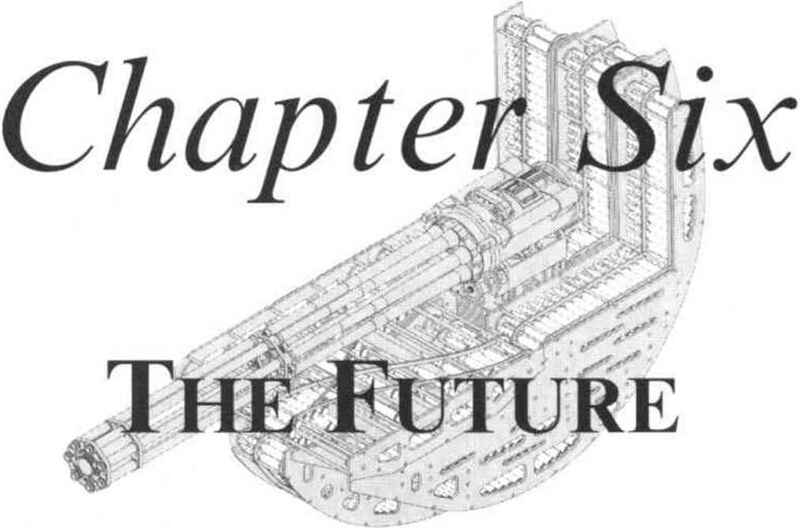 A gun designer of a century ago would instantly recognise and quickly understand our current heavy automatic weapon systems in almost all respects, with only a few concepts such as proximity fuzes and radar-directed mountings being beyond him. This situation might well change in the foreseeable future, with new developments in both ammunition and weapons, although the essential conservatism of military procurement processes (which usually demand proof of overwhelming advantages, with no disadvantages, before adopting a new technology) mean that rapid changes are unlikely. What kind of guns on a cobra helicopter machine guns? Why are Gatling guns not on fitted on helicopters? What size gun on a hind helicopter?